Is GTA: Chinatown Wars your favourite GTA? 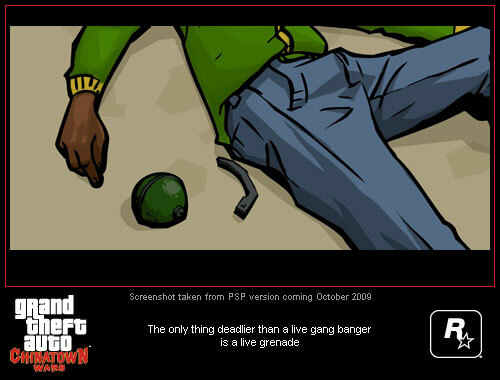 Did you purchase a Nintendo DS solely for GTA: Chinatown Wars? 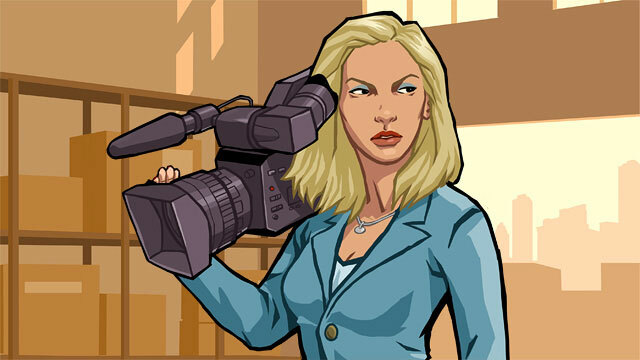 All the latest news on Grand Theft Auto: Chinatown Wars. 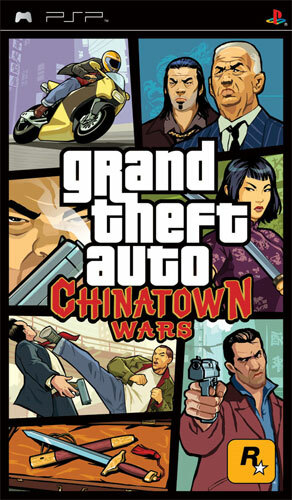 The PSP version of Grand Theft Auto: Chinatown Wars is now available in stores in North America. The game will be available in Europe this Friday (October 23rd). The fourth part of Rockstar's GTA: Chinatown Wars PSP audio preview is now available! "Kicking off ten years ago as one of New York's first late-night outdoor parties, Turntables on the Hudson are still going seriously strong thanks to their sophisticated blend of hip-hop, house and funk, peppered with latin sounds, afrobeat and even European gypsy vibes. Check out the audio player below for a snippet from their radio station, exclusive to Grand Theft Auto: Chinatown Wars for PSP." 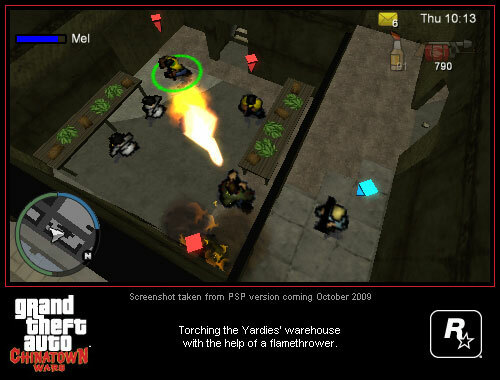 Chinatown Wars for the PSP will be released on October 20th in North America and October 23rd in Europe. Rockstar has put up a short mission preview from the PSP version of GTA: Chinatown Wars. The mission is called "Factory Fun", and involves torching a weed factory belonging to the Yardies. Screenshots taken from the mission "Factory Fun". Part three of Rockstar's GTA: Chinatown Wars PSP audio preview is now available. "Part three of our music reveals from the exclusive soundtrack of Grand Theft Auto: Chinatown Wars for PSP delivers the genre-leaping instrumental rock sounds of Tortoise. "Often referred to as 'post-rock', this Chicago-based outfit was one of the very first bands to fearlessly incorporate hip-hop, techno, dub and drum'n'bass into modern guitar-based rock'n'roll in the late 1980's, earning them worldwide acclaim. Influential to this day, Tortoise's most recent album is the critically acclaimed Beacons of Ancestorship." The official trailer for the PSP version of GTA: Chinatown Wars is here! A new batch of screenshots are available over at Kotaku. In addition, Rockstar has announced that a trailer will be released today, probably within the next few hours. Stay tuned! Head over to Rockstar News Wire for information about the music featured in the preview. "We're proud to announce the addition of the biggest Metal outfit never to hit the big time and one of the greatest stories in rock'n'roll: Anvil. A one-time inspiration and influence to bands like Metallica, Motorhead and Slayer, Anvil were on the precipice of Metal superstardom when a series of unfortunate events cast them into relative obscurity." Rockstar has promised more soundtrack details next week, so stay tuned! Remember this? Rockstar will be on the road again for a PSP tour around the US. Earlier this year the guys at R* gave away lots of goodies like stickers, t-shirts some rare items and a exclusive look at the game, so if you live in the US check the details below and don't miss it! "The Chinatown Wars van will be on hand at the Sony booth for select dates from the Dew Tour, starting with the Toyota Challenge at the Energy Solutions Arena in Salt Lake City, Utah - September 18th to the 20th. We'll also be at the PlayStation Pro at the Amway Arena in Orlando, Florida - October 15th to the 18th. For Dew Tour event information, check out www.allisports.com/tours/dew-tour. We will also be joining our friends at DUB for upcoming stops on the DUB Show Tour. September 26th in Miami at the Miami Beach Conference Center and October 18th at the National Orange Show Events Center in San Bernadino for D-Day L.A. '09. Visit www.dubshowtour.com for all the particulars." Keep an eye on our site as well as the R* News Wire for updates.